Ready to assemble. Features pneumatic seat height adjustment. Height adjustable "T" style arms with self-skinned urethane armcaps. 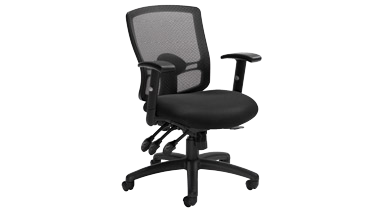 Back height adjustment and adjustable lumbar support. Independent and infinite postion back angle adjustment. Position tilt-lock and tilt tension control. Seat depth adjustment (seat slider). Black. Mesh back with air mesh upholstered seat. Medium Back.